Keeping your blood sugar stable is often an overlooked factor in maintaining your health. We tend to think snacking will result in overeating and weight gain. Well, just the opposite is true. When you make sure to eat something every 2-3 hours you prevent your blood sugar from going too low. Low blood sugar will make you feel unfocused, fatigued, cranky, and will trigger you to overeat at your next meal (likely something high in carbohydrates – think cookies). Snacking between meals will stop these effects from happening and keep you energized, focused, and help you make mindful healthy food choices to prevent you from overeating. If you’re a diabetic, blood sugar control is of even more importance for preventing diabetes complication. You don’t want it too go too low, especially if you are taking diabetic medications, and you also want to keep it from spiking to prevent damage caused from elevated blood sugar in the form of heart disease, renal disease, and vision problems. Snacks will help to keep your blood sugar at a steady level. So then, what foods should I be snacking on? Well, I’m glad you asked! Snacks that will prevent sugar spikes and keep your blood sugar balanced include fiber, protein, and/or healthy fats (much like you would have at meals). I like to call it the Blood Sugar Balance Trifecta since each component will help slow the rate sugar (glucose) is absorbed into the body and prevent blood sugar spikes. It will also help to keep you fuller for longer which will help you manage your weight. All nuts are jam-packed with fiber and healthy fats with a good dose of protein. They are easy to store and make for a convenient grab-n-go snack. Create individualized servings in small ziplock bags and store in your freezer to maintain freshness and easy access. My personal favorite! Edamame are immature soybeans in a pod. They have equal parts protein, fiber, and fat which make them the perfect snack for blood sugar control. At only 190 calories per cup it serves up a powerful nutritional value. It not only contains both omega 3 and omega 6 but also provides phytonutrients called isoflavones. Research has shown that isoflavones, also known as phytoestrogens, can help prevent breast cancer and heart disease. Throw some edamame into your stir fry, salad, or eat it as is. You can find them in the freezer section of your supermarket. Berries are relatively low in sugar and high in fiber making them a great fruit choice. For example, 1 cup of blueberries provides 3.6 grams of fiber and about 80 calories. In addition, berries have been shown to counteract the damaging effects of glycation by-products (that’s when sugar binds to cells and produce damaging compounds that play a role in diabetes complications.) Pair berries with nut butters or a sprinkle of chia seeds for some healthy fats and added fiber. By providing mostly protein, beef jerky won’t spike your blood sugar and is super easy to commute with when you are on the run and want something you can just throw into your bag and eat on the go. Make sure to read the nutrition label for nitrite-free options. Another super easy high protein snack! No prep time or clean up needed. Just grab from the fridge and go on with your day. Pair it with a sliced apple or some dried fruit. Feel free to swap string cheese for 1 ounce of cheese you prefer, e.g. goat cheese, cheddar, etc. If you’re on instagram you know most people have a bit of an obsession, #avocoadotoast. Which is awesome because it is loaded with monounsaturated fat that is good for both blood sugar control and preventing heart disease. 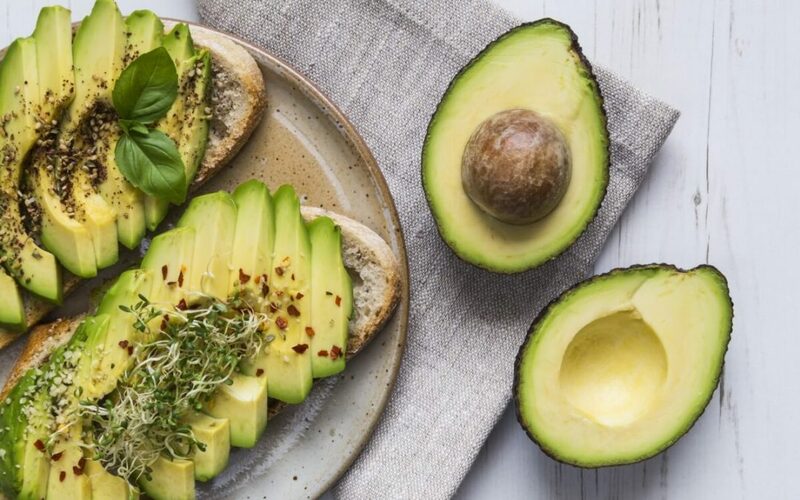 It also provides a punch of fiber, 1 medium sized avocado has approximately 13 grams of fiber (that’s about 50% daily value for women and 34% for men). Enjoy half an avocado with a drizzle of balsamic vinegar or smashed on a whole grain toast. Hummus is a great plant-based choice of protein and fiber. Pairing ¼ cup of hummus with a cup of veggie sticks will increase fiber intake and provide you with vitamins and minerals that will nourish your body and keep you satisfied. Boiled eggs have practically no carbohydrate content. Which means it won’t spike your sugar and will keep you satiated. Boiled eggs are a simple and easy snack that most people don’t think of as a snack and reserve for meal time. Let’s change that! They make a great snack and their high protein content will also help curb your cravings. Pair a sliced boiled egg with some chopped tomatoes and a drizzle of olive oil for a boost of fiber and heart healthy fats. Tuna is a convenient and easy source of protein. Just open a can, mix with some mayo or mustard and you’re done. Enjoy over a piece of whole grain toast for some added fiber. There you have it. Nine easy and simple snack ideas you can enjoy to keep those blood sugars balanced for energy that will last you all day.